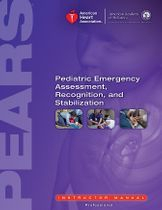 Pediatric Advanced Emergency Assessment, Recognition and Stabilization PEARS helps healthcare providers develop the knowledge and skills needed for emergency evaluation and treatment of seriously ill infants and children. This course teaches providers how to recognize respiratory distress, shock and cardiac arrest, and provide appropriate lifesaving intervention with the initial minutes of response until the child is transferred to an advanced life support provider. The goal of PEARS is to improve the quality of care provided to seriously ill or injured infants and children, resulting in improved outcomes. This instructor-led course allows students to participate in simulated clinical scenarios and learning stations. Students with the Instructor work to complete the various PEARS skill practice stations and testing. Students must complete a written exam and receive a score of 84% or higher to successfully pass the class. AUDIENCE: This course is for healthcare providers (certified / non-certified or licensed / non-licensed) such as emergency medical technicians (EMTs), medical and surgical nurses, school nurses or any other healthcare provider in order to meet certain job, regulatory, or other requirements. This course DOES NOT teach PALS. If you need a Pediatric Advanced Life Support certification, see our Pediatric Advanced Life PALS course. COURSE FORMAT: This course is classroom-based with includes instructor, video, and skills interaction throughout the course. This course is approximately 7 hours in length (Full Course with CPR Testing), Update Course without CPR testing is 5 hours in length, Update Course with CPR Testing is 6 hours in length. CERTIFICATION: Upon completion of this course, students receive an American Heart Association PEARS Provider course completion card that is valid for two years.